Myths: "the Seven Years Famine"
Khnemu was one of the oldest gods of Egypt. The Egyptians' views of him changed somewhat through Egyptian history. He always was an important god and he remained so even in some semi-Christian sects two to three centuries after the birth of Christ! 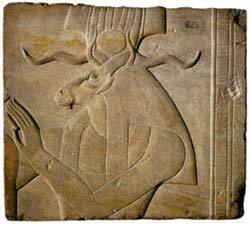 His symbol was the flat-horned ram and was depicted as a ram-headed man who wears the White Crown on his head. Khnemu was originally a water-god, and as such he is shown with water flowing over his outstretched hands and wearing a jug on his head above his horns. His name comes from the root, khnem, "to build". Khnemu Nehep, "Khnemu the Creator"
Khnemu Khenti-taui, "Khnemu, governor of the two lands"
Khnemu Sekhet ashsep-f, "Khnemu, weaver of his light"
Khnemu Khenti per-ankh, "Khnemu, governor of the House of Life"
Khnemu Neb-ta-ankhtet, "Khnemu, lord of the Land of Life"
Khnemu Khenti netchemtchem ankhet, "Khnemu, Governor of the House of Sweet Life"
Khnemu was worshiped from Thebes to Philae, but the principal sanctuaries were at the First Cataract (Elephantine and Philae).